WHAT TO EXPECT? Professional bands playing a small venue. 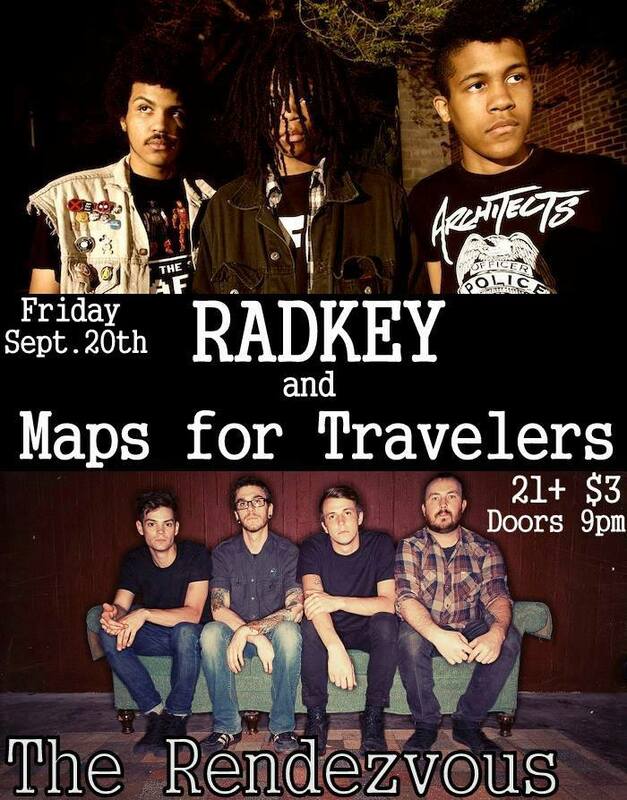 Radkey’s last show in their hometown of St. Joseph was just under a year ago. In that time they have received worldwide press including NME, The New York Times and Spin among several others. I was at the last show they played here in town when they headlined a gig, the other 11 people in the bar and I enjoyed it immensely. This time it won’t be so easy to get close to the stage I hope. I hope you will have to struggle to even see the stage myself. Maps For Travelers return to St. Joseph fresh on the heels of releasing their first full length album Change Your Name about a month before the show. The group is currently signed to independent label No Sleep Records from the West Coast. The group’s sound is reminiscent of a heavier Jimmy Eat World and especially acts like Cursive and The Desaparecidos. Their guitar heavy sound is sure to have their new cd flying off the merch table at The Rendezvous for this show. Good music makes wallets open. You can get your Tuning Fork Magazine with Radkey on the cover autographed! Remember the Vous? It’s still open! Lovers and haters alike should be their to judge these bands, it has been a while since each of them has played here and they are likely much improved versions of what they once were. This entry was posted in Coming Soon and tagged 9/20/13, Cat & Mouse, cd, Change Your Name, Coming Soon, Missouri, MO, Rakey Maps For Travelers, St. Joseph, The 'Vous, The Rendezvous, vinyl. Bookmark the permalink.